The OnePlus 5 has been officially launched today, through a live stream event on YouTube, in what seemed to be a pre-recorded video. So, without further ado, here is the OnePlus 5. The device sports a 5.5-inch 1080p Full HD display, with Optic AMOLED, and DCIP-3. The phone is powered by a Qualcomm Snapdragon 835 processor clocked at 2.45GHz, and an Adreno 540 GPU. The OnePlus 5 will be available in 2 variants: one with 6GB LPDDR4X RAM and 64GB of UFS2.1 Dual Lane storage, and the other with 8GB LPDDR4X RAM and 128GB of UFS2.1 Dual Lane storage. The phone reportedly has lower touch input lag. The device runs on OxygenOS, based on Android Nougat, with a new reading mode with ambient sensor, two-finger swipe for scrolling screenshots, and more "actually useful features". The Camera department on the OnePlus 5 comprises of dual rear cameras with a 20 megapixel Sony IMx 350 sensor with an f/2.6 aperture, and a 16 megapixel camera (Sony IMX398) with an f/1.7 aperture. The camera has fast autofocus, with The front camera is a 16 megapixel selfie lens which has the Sony IMX 371 sensor. The device is backed by a 3300 mAh battery which supports Dash Charge. 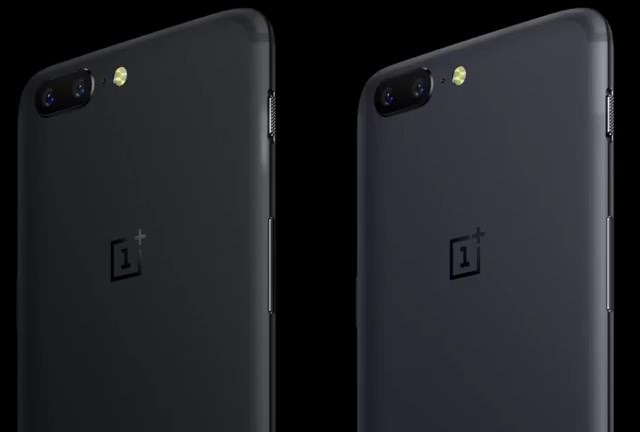 The OnePlus 5 has a 3.5mm Audio jack, and a USB Type-C connector, along with a single speaker grille, on the bottom of the device. The OnePlus 5 can be charged up to 29% in just 15 minutes, and up to 58% in 30 minutes. The device supports Cat 12 LTE with 3CA (Carrier Aggregation), Bluetooth 5.0, NFC, and has a ceramic fingerprint sensor on the front panel, which can unlock the device in just 0.2 seconds. The OnePlus 5 has been priced at $479 and £449, for the 6GB RAM/64GB storage variant, and is available for pre-order right now, and will start shipping from June 27th. The OnePlus 5 will come in 2 colours: Midnight Black and Slate Gray. OnePlus' CEO Carl Pei made some bold statements about the company, which also included accusing rival manufacturers for useless innovation. We are not sure if this was meant to be ironical, as OnePlus itself has had zero innovation with the design of the OnePlus 5, with the new device being a blatant copy of the iPhone 7+. So much for the phone being in development for 3 and a half years. OnePlus even had the nerve to boast that it took feedback at every state right from the beta program, and its community. If that is true, why didn't it listen to OnePlus 2 users will forever remain a mystery.